Excessive weight gain during pregnancy increases the risk of obesity in both mothers and babies. To avoid dangerous gestational weight gain, it is important to identify effective tools for behavior change. 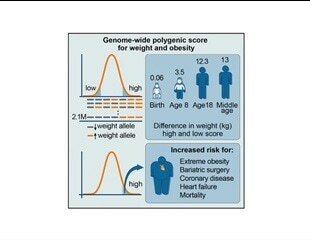 Polygenic scores can predict a person's risk for conditions like coronary artery disease, breast cancer, and type 2 diabetes (T2D) with great accuracy, even in patients who lack common warning signs. This new genome analysis tool holds promise for physicians, who may be able to intervene earlier to help prevent common disease for at-risk individuals. Results from a study led by researchers from Queen Mary University of London has found that an association between shorter stature and higher risk of heart disease is mainly attributed to our lungs. Metformin,a common drug used to treat type 2 diabetes, is often used during pregnancy where the mother suffersfrom polycystic ovary syndrome. Sitting or lying down for long periods not only increases the risk for various diseases and premature death; but also costs the NHS £700m per year. Girls are not the only ones who go through puberty early if they have obesity. Boys with obesity enter puberty at an earlier age than average, according to a study that will be presented Sunday at ENDO 2019, the Endocrine Society's annual meeting in New Orleans, La.